My laboratory is dedicated to discovering new optical treatments and diagnostics, mainly for problems in dermatology. Light can pass harmlessly through live tissues, producing selective changes exactly at the sites of light absorption. Using pulses of light at wavelengths that are selectively absorbed in targets (blood vessels, pigmented skin cells, hair follicles, sweat glands, etc), light can selectively destroy these microscopic targets. A host of useful laser treatments have come from our work. Motivated initially to treat vascular birthmarks without scarring in children, we developed the concept of selective photothermolysis (SP). This is now the standard of care. 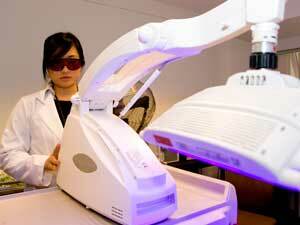 We subsequently developed other lasers for tattoo removal, treatment of pigmented lesions, and permanent hair removal. Recently, the concept of treatments using arrays of microbeams was developed, called fractional photothermoloysis. Presently, we are developing laser targeting of other skin structures such as sebaceous glands, sweat glands, and fat. The research involves physical and biological mechanisms, laser technology modifications, novel light delivery devices, as well as preclinical animal and human studies. 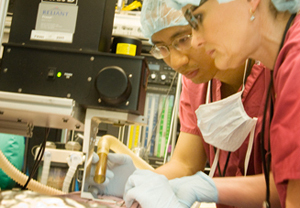 Photodynamic therapy (PDT) uses light-activated dyes or drugs to treat cancer, pre-cancer, abnormal blood vessels, inflammation, and other targets. For example, we discovered that PDT can potently inhibit the most common skin disease, acne, by affecting sebaceous glands. Using local and systemic photosensitizers, we are studying new therapies for vascular lesions, skin cancer and acne. Another initiative is to find less-invasive, effective ways to localize skin cancers as a guide to therapy. The first infrared confocal laser-scanning microscope was invented and developed at Wellman, which creates “living biopsy” images. New approaches for imaging skin cancer are also being developed using polarized light fluorescence and scattered light imaging.